Nothing speaks to an artist’s greatness like consistency, making one masterpiece after another. With that in mind, I would say that A Sound of Thunder have enter the realms of greatness. The quality of their music has been so high over the past few years that it is easy to see. They first came to my attention with 2012’s Out of the Darkness, and grew in my esteem with 2013’s Queen of Hell and Time’s Arrow, an album that I called “a masterpiece.” Their latest release, The Lesser Keys of Solomon, is another one. Based out of the Washington D.C. area, the band is comprised of Nina Osegueda (vocals), Justin Schwartz (guitar), Chris Haren (drums), and Jesse Keen (bass). They have been together in their current line-up for over four years now and things could not be better from a musical standpoint, creating some of the finest heavy metal music around. The Lesser Keys of Solomon is a rich and wonderful ride that is nothing but excellence. The short opener, “Nexus of Realities,” is a real tone setter, giving a glimpse of the dark and heavy moments that are to come. Headstrong and powerful, “Udoroth” has a presence unlike any new song that I have heard in a long time. With a tale to rival the myths and legends of old, it is one domineering metal song that will have you hitting the repeat button over and over. “Fortuneteller” keeps the ball rolling with its sick opening riff and crashing drums that is finally completed by the arrival of Nina’s amazing voice, bringing a seemingly mystical aspect to the song. Changing the album’s pace is “The Boy Who Could Fly.” It is slow, sad song that really plucks at the heartstrings thanks to the pain and emotion conveyed through Nina’s vocals. Do not let the description as a “slow” song fool you, because this song is pure metal – just listen to the instrumental part in the second half of the song. “Elijah” is an epic song that will take you on a wild and frightening journey. It shows Nina at her absolute best, taking on the role of multiple characters that really show off her range and skill. It is one dark tale that would make the Grimm Brothers proud. “Master of Pain” is pure classic heavy metal. Heavy guitar riffs, crushing drums, and a powerful voice that soars above everything rules the day on this one. “Blood from the Mummy’s Tomb” is another dark and heavy song which weaves a tale of horror and suspense, and would be right at home in a Hammer film. The fantastic guitar solo and brisk drumming are the toppings on the cake. “Black Secrets” carries a brooding heaviness and more fantastic rhythms, making it right at home with the rest of the album. The ominous “One Empty Grave” and chilling “House of Bones” bring the album to an end. “House of Bones” is one chilling, supernatural song, bringing all the elements that have made The Lesser Keys of Solomon so amazing together for one explosive conclusion. 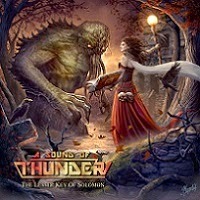 A Sound of Thunder has done it again with The Lesser Keys of Solomon. They have made another phenomenal album to add to their already stellar track record. They are my favorite new metal that has emerged over the last few years. The Lesser Keys of Solomon is easily one of the top metal releases of the year. If you are not paying attention to this band, then now is a great time to start.